My first time to Darwin was a stop at the airport in 2007, which we all know doesn’t count as a visit. I was flying from Sydney to Mumbai, which stopped at Darwin on the way. That flight route was made famous by Ralph Fiennes and a Qantas flight attendant, though my flight was not as memorable. The following year I flew from Singapore to Melbourne via Darwin, and I realised on that flight that Darwin is closer to Southeast Asia than it is to Southeast Australia. A quick look on the map could have told you that, but travel has a way of making you think about your place in the world. I finally got to properly visit Darwin on my way back to Melbourne from Bali, ten years after my first “visit”. 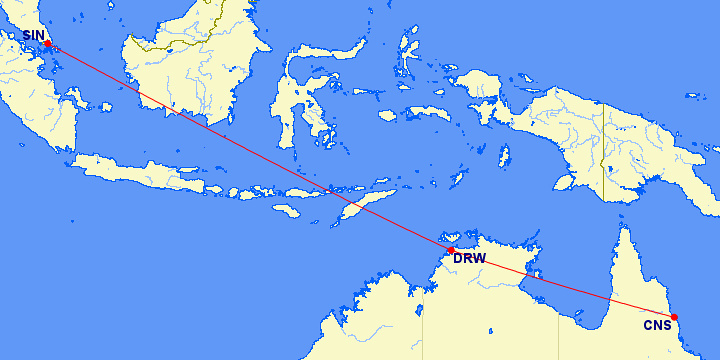 AirAsia fly from Bali to Darwin, so rather than getting a direct flight I made a detour. I was only there for a short stopover, so I didn’t do anything of a touristic nature. Instead, this post is about my observations of Darwin’s place in Australia as a gateway to Asia. “Darwin is like a big country town” were the words from the hotel receptionist, which was the conclusion I came to early on. According to the 2016 census, Greater Darwin has a population of 143,629 and is the 15th biggest city in Australia. I stayed in the CBD over a weekend, which devoid of weekday office workers added to the feeling of emptiness. 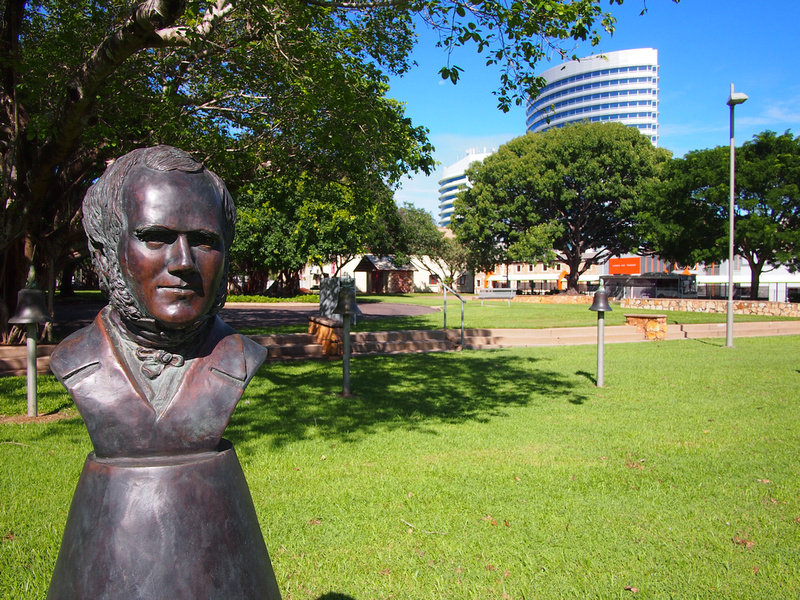 For tourists, Darwin has traditionally been the gateway to Outback Australia. You either fly in and begin an Outback adventure, or you are driving around the country and Darwin is a resupply/civilisation stop. It didn’t help that I arrived at the tail end of the rainy season, which puts a hold on many activities that would be business as usual in tropical Asia. One thing I wanted to see was the Mindil Beach Sunset Market, which has a lively Asian food market. This only runs in the dry season, so I shall return on a longer trip to the Northern Territory. My impression of the CBD is that it’s starting to have a renaissance, like other cities in Australia have been through. In the eighties and early nineties there were very few residents living in the Melbourne CBD. Now it is filled with apartment towers and the supporting cafes and restaurants that go with an increased population. There appears to have been a recent apartment boom in Darwin, which I think will fill in eventually. There have been some interesting developments in the city, including the waterfront precinct which has an artificial beach surrounded by apartments and a retail area. 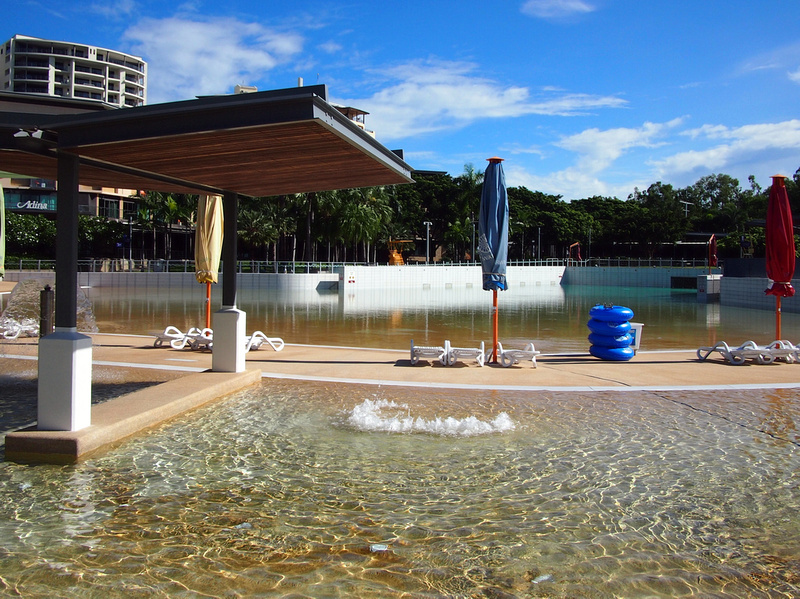 Next to the beach is a wave lagoon which also looks appealing for hot days (so basically every day). 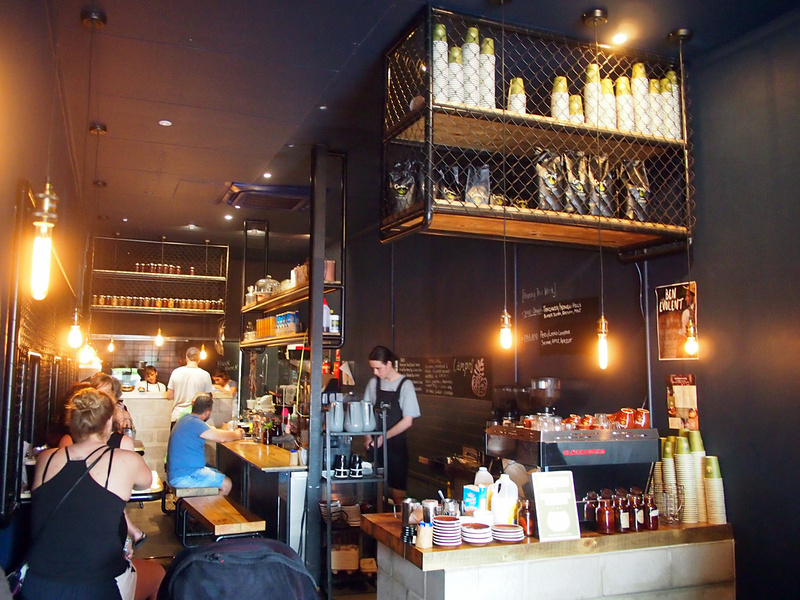 With more people living in the city the cool cafes and restaurants will follow. I visited The Rabbit Hole, which would not be out of place in Melbourne. 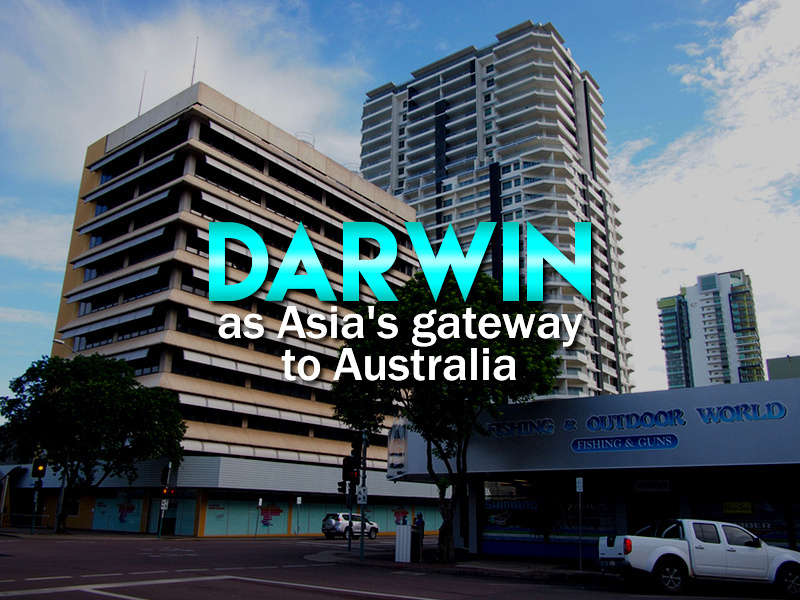 My interest in Darwin is in its future as a gateway to Asia. The idea is not a new one, with the Territory’s former Chief Minister having said that Darwin is Asia’s gateway to Australia. I arrived in Darwin after having spent the last ten months in Asia. I was not even 24 hours in the city and I was experiencing some Asia withdrawal symptoms, brought on by the wide open spaces and quiet streets. There was also the reverse culture shock (and sticker shock) to contend with as well. 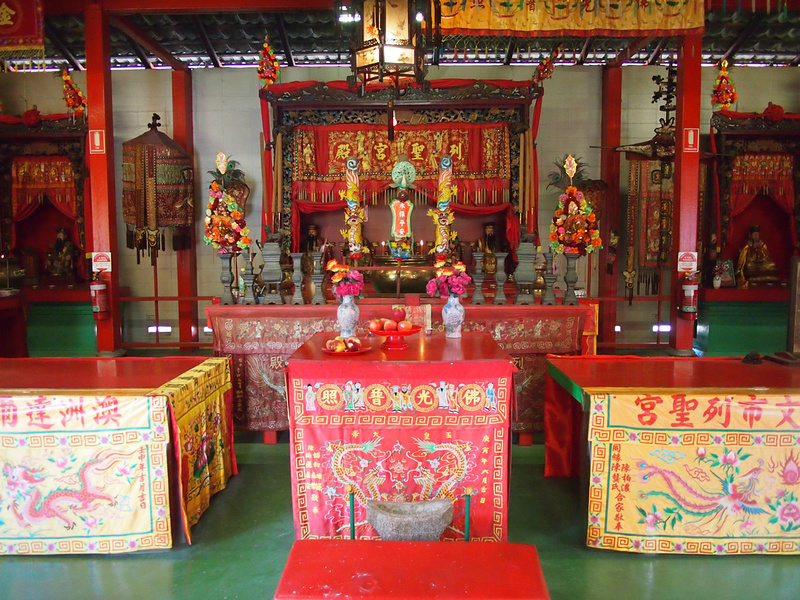 I saw on the map that there is a Chinese temple, so to salve my withdrawals I paid a visit. I arrived to find a rather humble temple. To be fair the inside is more ornate, which made me think of the plain exterior of churches in Italy that are more extravagant inside. 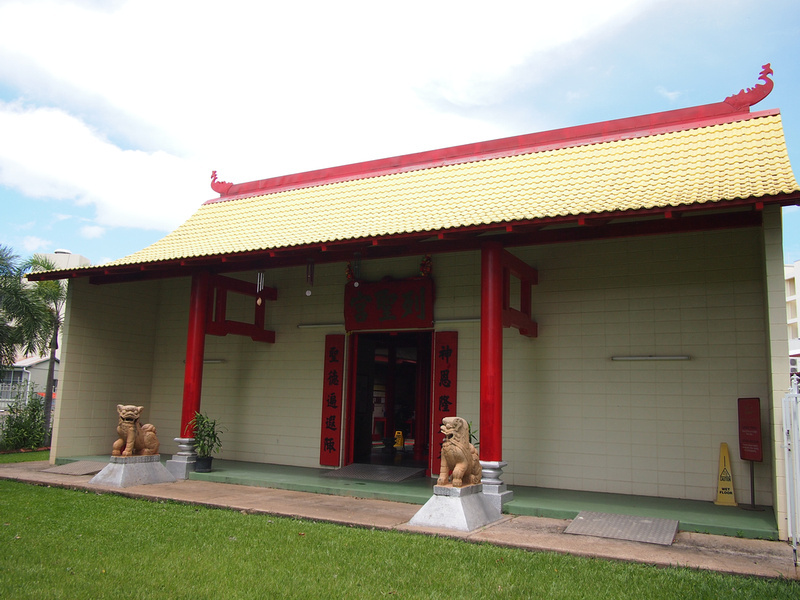 After visiting this temple it made me wonder about the history of the Chinese population in the Northern Territory. There have been Chinese Australians since 1818, which is a fact that is not celebrated in Anglo-centric Australia. Our shameful treatment of Chinese migrants is similar to the experience in the United States. 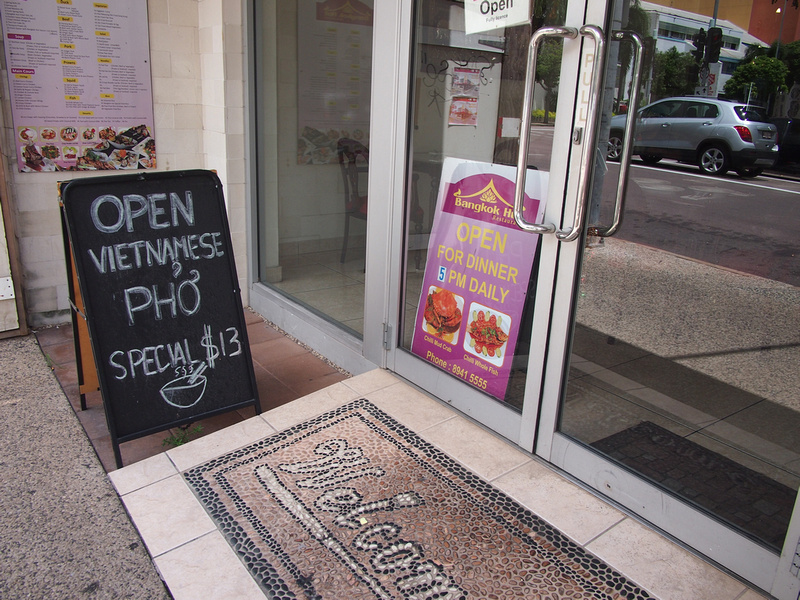 Even though there is a historic connection of Chinese in Darwin, there isn’t a Chinatown street like in other capitals in Australia. There is a Chinatown development that was proposed in the early 2000’s which has since stalled. 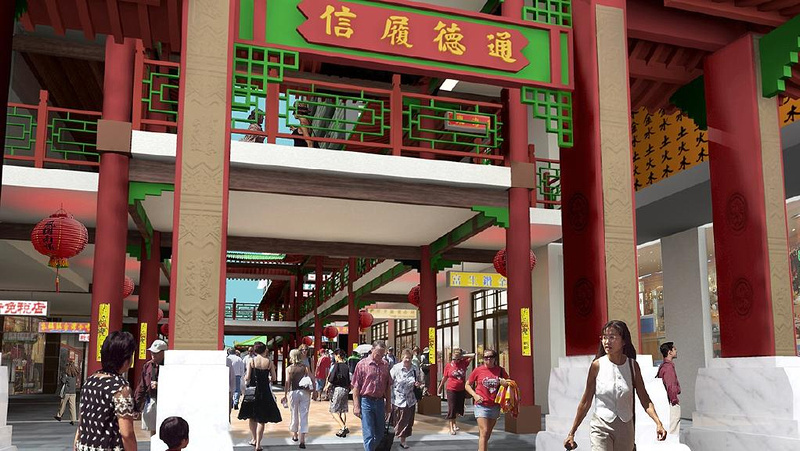 A new developer took control of Darwin Chinatown in 2016, stating that they remain committed to the original plan of “developing a unique, Chinatown themed mixed use development that provides a link to Darwin’s rich Chinese heritage”. The development will have three towers with a ground level retail and entertainment plaza. 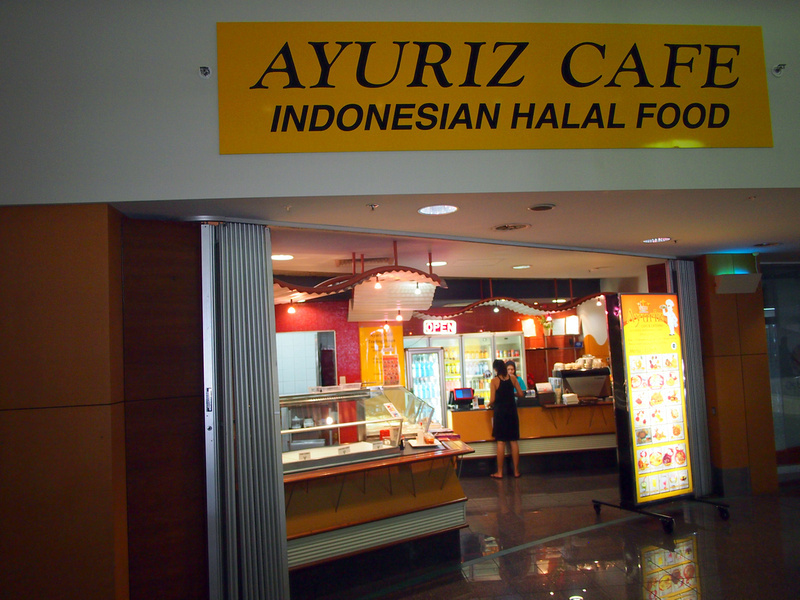 Having flown from Singapore and Bali on Asia-based low cost airlines to Darwin, I wondered what Darwin would look like as a major airport serving as a hub between Southeast Asia and Australia. When I have such aviation-related thoughts I turn to the great Great Circle Mapper map maker (say that fast ten times). You can make all kinds of route maps on this site, and all the maps you see in this post are from gcmap.com. What if low cost airlines from around Southeast Asia flew to Darwin. 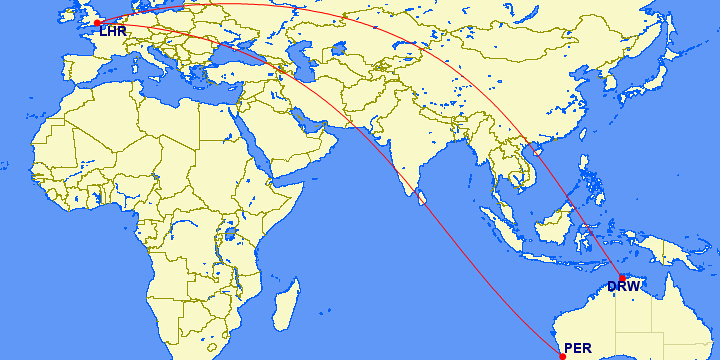 An Airbus A320-200 (used by AirAsia and Vietjet as two examples) has a range of 3500 nautical miles. I’ve drawn this map at 3000 nautical miles to leave some fuel in the tank. This range covers every country in Southeast Asia, and onward to every place in Australia and New Zealand. In 2009 Jetstar announced that they were turning Darwin into a hub for Asia flights. Flights that became a reality included Singapore, Bali, Ho Chi Minh City, and Manila with an onward flight to Tokyo. By the end of 2013 Jetstar closed their Darwin base, bringing this experiment of a hub for Asia to an end. Darwin airports high airport fees were a factor, which reports in aviation forums were saying were the highest in the country. I don’t have a citation for that, but this letter from Northern Territory Airports mentions factors that make Darwin more expensive. 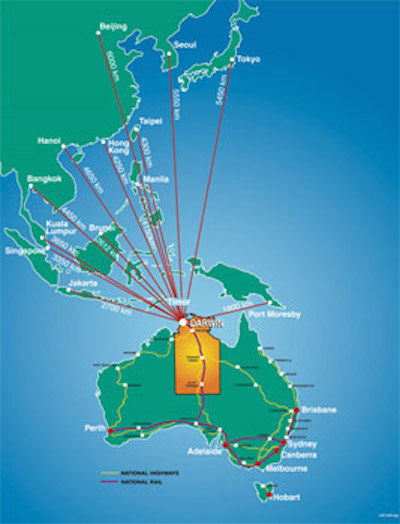 Darwin used to have more international flights when it was a staging point for the Kangaroo Route. Qantas began its Sydney to London service in 1947, which stopped in Darwin, Singapore, Calcutta, Karachi, Cairo, and Tripoli. International airlines that stopped en route in Darwin included UTA (Union de Transports Aériens), BOAC (British Overseas Airways Corporation), Alitalia, and Air India. 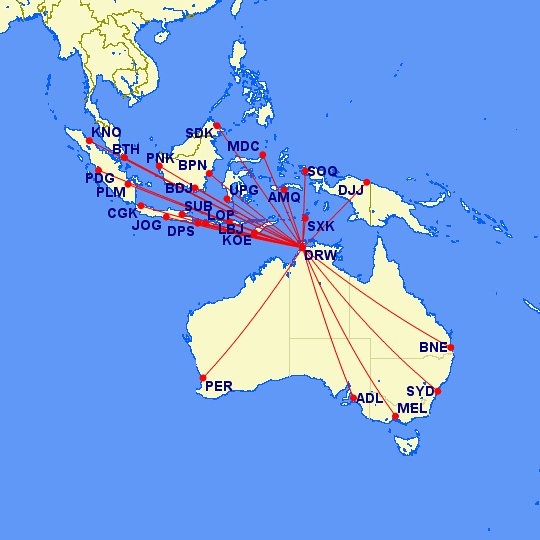 When modern jets were able to fly from Europe to Australia in one stop, the multi-legged routes became redundant. While it’s improbable that Darwin will get such a roll call of European airlines again, there is a future for more flights from across Asia. The big missing link is direct flights between Darwin and China. Qantas did trial a Darwin-Hong Kong charter flight with the hope of making it permanent. There have been calls to reopen the Kupang-Darwin route, and Indonesia has invited Australian airlines to fly from Darwin to Saumlaki in Maluku, where the Indonesian government is developing the area as a tourism destination. The population of Indonesia in 2013 was 249.9 million. That’s a quarter of a billion people in a nation with over 17,000 islands, yet most Australians only experience of Indonesia is Bali. Indeed, I have read about bogans in Bali not even knowing they were in Indonesia. For a country that is so close to Australia, we really should be better connected. Currently the only flights from Darwin to Indonesia are to (you guessed it) Bali. There used to be flights to Jakarta (Java) and Kupang (West Timor), and the only recent new proposal has been the aforementioned flight to Saumlaki (Maluku), which seems unlikely. To Jetstar’s credit they tried to do something different by offering a Perth to Lombok flight in 2013, which lasted less than a year. I think a better route attempt would have been Darwin to Yogyakarta, where Jetstar (or any airline) could at least market visiting the biggest buddhist temple in the world. Qantas announced that they will launch a non-stop Australia to London service from Perth. The flight will take 18 hours using a 787-9 Dreamliner with up to 236 passengers. I personally have no desire to fly 18 hours non stop (unless it was in one of these), not to mention the long term effects on the crew who are continually in a plane that long. Darwin to London is 13,872 km while Perth to London is 14,499 km, making Darwin 627 km closer. A 787-9 Dreamliner has a range of 15,750km. Former Deputy Prime Minister Tim Fischer suggested that Darwin should pinch the planned Qantas Perth international hub and become Australia’s Dubai (referring to the current Qantas hub in Dubai). No doubt Qantas gave it thought, with Perth as the preferred option for being a bigger city with a large British expat community. 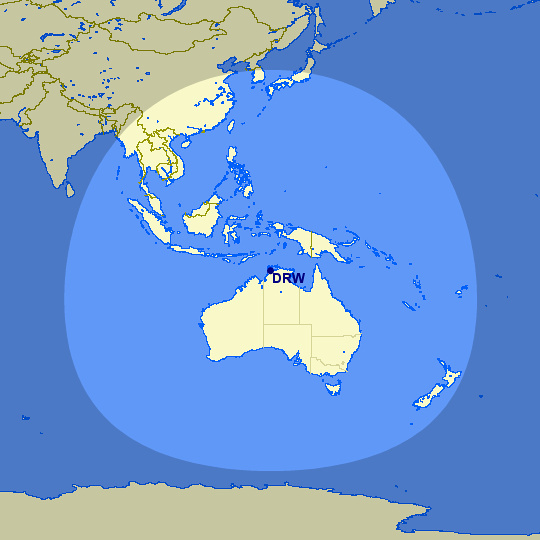 Another proposal that would have opened up Darwin airport to Asia was a Northern Australia “open skies” plan. The Northern Australia Green Paper suggested allowing foreign budget carriers to operate domestic flights between airports located north of the Tropic of Capricorn (latitude 23.5° south). That would include flights between Broome, Darwin, Cairns, and Townsville. For example a carrier from Singapore could fly Singapore – Darwin – Cairns, and be allowed to carry domestic passengers between Darwin and Cairns. This would have the benefit of opening up Northern Australia to more competition between regional routes, encouraging growth between the major cities of the north. The open skies proposal would also allow quicker international flights from Darwin. Currently Darwinites have to backtrack to the southern cities for international connections, especially as Qantas likes to funnel traffic through Sydney. The plan was of course vehemently opposed by the incumbent airlines who enjoy a monopoly on northern routes. Foreign jets on domestic Australian routes has been done before, so maybe its time will come again. The most radical idea that reappears every few years is the idea of a free trade zone in Northern Australia. This ranges from the entire region above the Tropic of Capricorn, a chunk of Northwestern Australia, or a special economic zone in a selected city (like Darwin or Broome, for example). An S.E.Z has been attempted before with the Darwin Trade Development Zone. This began in 1985 and ended in 2003 by “government interference and a focus on low-skilled labour”. It remains as Australia’s first and only free trade zone. Another idea to populate the north is this proposal for a Singaporean ‘charter city’ in the northern parts of Western Australia. How about if the Darwin Trade Development Zone was restarted under this idea? The charter city idea sounds similar to the Multifunction Polis (MFP) proposal that was meant to be some kind of futuristic Japanese city of high-tech industries. The idea was thrown around on the national news for years (this was pre-internet), and in the end no one really understood what it was meant to be. Also the Australia of the eighties was not ready for the idea of integrating into Asia. In the eighties, racist scaremongers were selling this as a frightening Bladerunner-esque city with Japanese food on every corner. I say shut up and take my money! This idea would probably have a better chance today if it had a more catchy name than MFP. This ABCTV story on the 7.30 Report from 1990 is an interesting time capsule of that era. What is the likelihood of any of this happening? Highly unlikely. Big ideas are not Australia’s forte, so don’t expect any of these ideas to happen anytime soon. Not that there hasn’t been any opportunities to build a hub/develop Northern Australia. Much has been written about how Australian governments have blown mining boom cash and subsidised mining companies rather than extracting more taxes from them. Norway built the biggest sovereign wealth fund in the world with revenue from its offshore oilfields. We could have had a sovereign wealth fund like Norway, or a government investment company like Temasek Holdings of Singapore (which at one point owned more of Australia than Australia). Privatised airports haven’t helped either. Sydneysiders are well familiar with the price gouging that goes on at Kingsford Smith, and you know privatisation was a bad idea when a conservative paper rips into it. What if instead of handing a monopoly to a private company the airports remained government owned (like Dallas/Fort Worth). Landing fees could be kept low, or even subsidised from the proceeds of mining income in order to develop the region. These are all thoughts for another post, so I’ll stay out this proverbial rabbit hole for now. 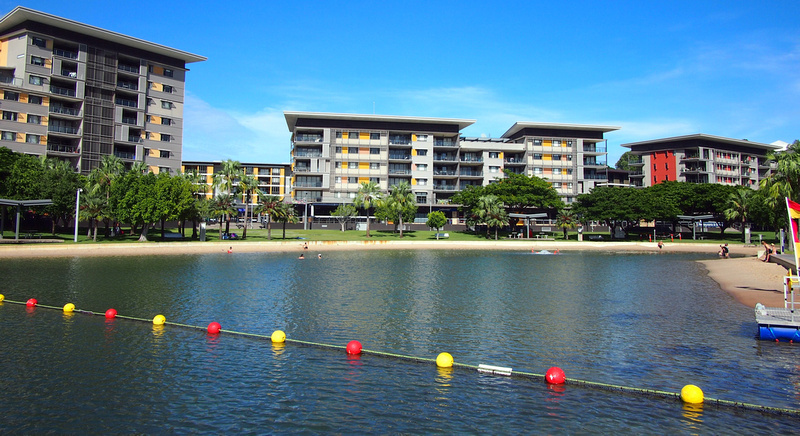 I’m sure I will return to Darwin to visit Kakadu and the Outback, so I look forward to seeing what’s new in Darwin. Your post was really engaging, loved it! Nice read…..information are really useful. As a Darwinite I approve of this grand vision! Great post! 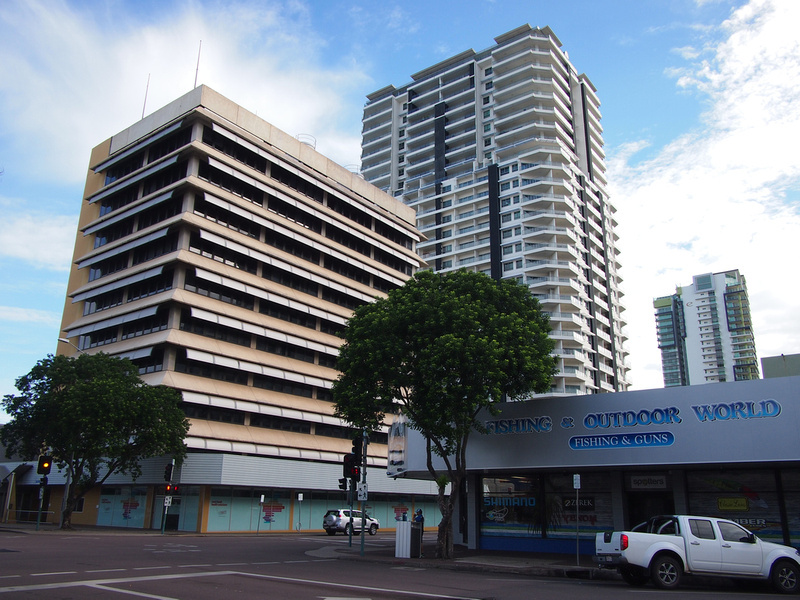 Lot of good ideas for Darwin to come through, it seems that it has to the apathy of the administrations… the city really has a potential to become a hub, great for tourism and businesses alike! Awesome Pictures its looking pretty cool and lovely in this post. This article will help the traveler what to do in Darwin as Asia’s gateway to Australia. Awesome Pictures .Great post! Lot of good ideas.Your post was really engaging. Thanks for giving out this information. I just some know asias gateway, but this guide is just helpful specifically when I will plan my tour to Australia early next year.